One of the best areas to scuba dive within North America is in the Florida Keys, a long string of islands just south of Miami. For any scuba diver traveling to southern Florida, even a quick day trip to the Florida Keys is worthwhile. There's great scuba diving all along the Keys from the first community of Key Largo, through to the middle at Marathon and all the way to the end where Key West is located. One can get to Key Largo in about 45 minutes from Miami and the protected Pennekamp marine park in the surrounding waters offers much more marine life to see than the waters off Miami or Fort Lauderdale. Key Largo in particular is a scuba diver's town with numerous dive operators and some retailers who carry diving equipment and gear. One of the great things about scuba diving in the Florida Keys is the variety of dive sites for every level of diver. Many of the nicest coral reefs loaded with fish are located in beginner level dive sites like Molasses Reef and French Reef. With depths of 30 to 50 feet, these are perfect dive sites for newly certified scuba divers as well as those who wish to do night dives. There's even some good wreck diving in shallow dive sites like the Benwood wreck where the resident marine life will not disappoint any diver. For more advanced divers, there are some spectacular deep dives featuring large wrecks like the Duane, a former coast guard ship sitting upright. The most recent ship that was sunk for scuba diving is the Spiegel Grove which again is for advanced divers. Many scuba divers from North America and other parts of the world come to the Florida Keys for their open water certification dives as well as more advanced training. Accommodations are plentiful right in the communities along the Keys and range from simple motels all the way up to high end resorts. 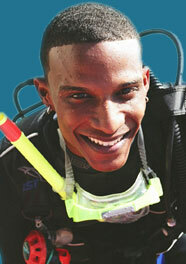 Many have special packages just for scuba divers where there's an arrangement with one of the local dive operators. There's also relatively inexpensive accommodations in Florida City which is the closest community back in the Florida mainland about 20 minutes from Key Largo. After the day of diving, there are lots of restaurants serving fresh seafood for even the hungriest of divers. Another attractive feature of Florida Keys diving is the cost. Especially for the quality of the dive sights, the cost of diving here is lower than in many of the Caribbean destinations like the Bahamas and Cayman Islands. For those who are not ready to try scuba diving, there are some decent sites to snorkel in the Keys including one of the best in the U.S. at Looe Key. The marine life that can be seen here has convinced quite a few snorkellers to finally pursue scuba diving certifications. The Florida Keys has enough other activities to do besides scuba diving to keep non-divers busy. There's interesting shopping, water sports, beaches (near the western part) and even two places to interact with dolphins. Of course, there's also the funky scene at Key West. The one aspect about scuba diving in the Florida Keys that some divers may not like is that the dives are not guided by divemasters from the various scuba operators. Divers who are used to following a local divemaster like the diving in destinations like Cozumel, will just have to team up in buddy groups here in the Keys. Despite this drawback, the Florida Keys still offers great tropical scuba diving without leaving the USA.